Home > Eating at School > Which is Better: School Meal or Packed Lunch? According to the School Food Trust and the Local Authority Caterers Association (LACA), in the school year 2009-10, take-up of healthy school meals increased in primary and secondary schools to around 321,000. The proportion eating school lunches is 41.4% in primary schools and 35.8% in secondary schools. These days, school menus offer a choice, rather than everybody eating the same thing, which makes eating more interesting, helps fussy eaters because there is likely to be something that they like, and teaches children independence and decision-making. Some schools issue menus at the beginning of the week, or even have them on the school website. School lunches can also give the children the opportunity to try new foods that they don’t get at home, and to try food from other cultures. Eating school dinners can offer more variety than having the same sandwiches every day. It can take a lot of time to think about different menu ideas to avoid packed lunches getting boring, and to shop for and prepare the packed lunches every day. School lunches are convenient and save parents time, and can often save money too. Some schools have a ‘grab and go’ option, allowing children who have lunchtime clubs the chance to get something healthy to eat. In 2005, a study showed that children who had school lunches had lower cholesterol levels, lower blood sugar and lower levels of insulin, as well as lower levels of leptin, which indicates the degree of ‘fatness’. Not all schools have fridge space to store packed lunches, and so on hot summer days, packed lunches may become unhealthily warm. Some parents have a perception that school lunches are unhealthy and packed lunches are healthy, because they can control the contents. Following efforts by campaigners such as Jamie Oliver and the School Food Trust, school lunches have become higher quality, more nutritious, more tempting and more attractive. They use many more fresh ingredients than they used to, and are significantly healthier than high fat, high salt and high sugar packed lunches containing sweetened fizzy drinks, crisps and chocolate – all things that have been banned from school canteens. Well-balanced school meals can teach children about healthy eating and create habits that they can carry on into the rests of their lives. They also provide a healthy, nutritious and well-balanced meal – for some children, this may be the only one they get in a day. Some schools also provide breakfast – many children do not get breakfast, and this can affect their behaviour and ability to learn. In some schools, teachers and parents have taken over the catering as a not-for-profit enterprise, and use locally-sourced and sometimes even organic ingredients. Some schools also have gardening lessons and gardening clubs where children can grow their own food. School lunches help young children to learn to eat on their own and improve their table manners, as well as teaching them about sharing, and in some schools about serving food for themselves and for other children. They also teach children social skills and give them a chance to talk to their friends and meet children from other years and other classes. While many school kitchens can be very helpful, it may be difficult for others to cope with children with food intolerances or allergies, especially if they are very sensitive to specific foods. These children and their parents may find it easier to rely on packed lunches prepared at home – it is important to make sure that they are healthy, and that the children understand the importance of not eating other people’s food. Some children will not eat unfamiliar foods, and making packed lunches can give parents the confidence that their children are eating something at lunchtime. 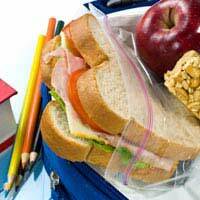 Packed lunches can be an opportunity for a child to plan and prepare his or her own lunch. Children who have packed lunches don't need to carry lunch money - this stops them spending their money on junk food instead of school meals, and could stop them being targets for bullies.